Bad Physics: ``Ballistic'' does not mean Evil! A very quick rant about some bad physics that has been annoying me. The tension between North Korea and the rest of the world is not a laughing matter, but has been all over the news recently. But when reporting, we often hear the that North Koreans are on the verge of producing a missile capable of carrying a nuclear warhead. But not only a missile! A ballistic missile. Maybe I am reading too much into it, but when a reporter says ballistic, it's often said as if it is synonymous with evil! I'm sure that it's because we like to say something is "going ballistic" when something crazy happens. But all ballistic means is that the missile is unpowered (after launch) and is moving only under the power of gravity. That's it. Here is a ballistic missile. See - not so scary! 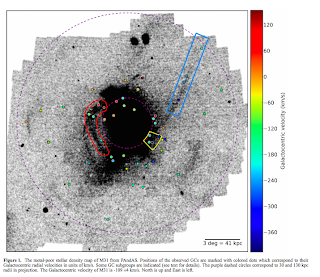 I've written before about this really cool study, using the AAOmega Spectrograph on the might Anglo-Australian Telescope to measure the speeds and chemical make-up of stars in the Galactic Bulge, the centre of our Milky Way galaxy. This is hard work, as there are a lot of stars spread over a large amount of sky, and so to get lots of spectra, you need to use the multi-fibres and large field of view of AAOmega. This has been a mammoth task over the last few years, with us taking 28,000 spectra, and in this study almost 17,5000 stellar velocities were used. But what is it we want to know? A weekend at home with the kids, with yesterday being wiped out by huge downpours from sunrise to sunset. Unfortunately, work has been full on, with a thousand different things going on, so no time to muck around. But we have another paper accepted, so here's a little summary. This week's paper is by PhD student, Jovan Veljanoski, working at Edinburgh's Institute for Astronomy. 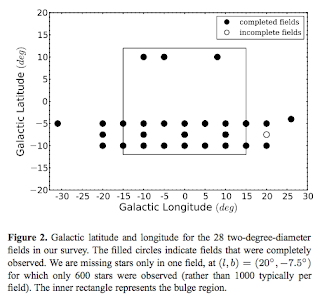 This is another paper based upon our extensive Pan-Andromeda Archaeological Survey (PAndAS) of Andromeda. As I've noted before, this survey reveals a mass of substructure in the outskirts of Andromeda, as well as a growing population of dwarf galaxies. It also reveals lots of globular clusters, balls of a million or so stars orbiting Andromeda. An astro-ph post today. I've written previously about some papers that I've published looking at a "new" cosmological model, which is claimed to be superior to the currently favoured model, the ΛCDM cosmology. 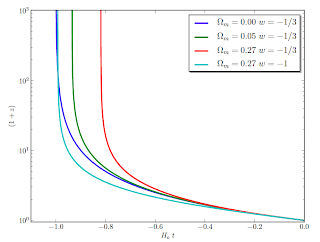 This model, known as the Rh = ct universe, is supposedly simpler, but in truth, it is not. And what's more, it is not a good description of the Universe we observe. If you're interested, you can read about it here. So, what's in my new paper. I take a look at a couple of claimed successes of the Rh = ct universe, namely that it explains the birth of quasars and does away with inflation. The crux of my argument is that the presence of matter in the universe actually destroys the claimed successes of this cosmology.